The Delaware County Daily Times Blogs: Eagles Blogger Room: Will you cheer for Asante Samuel? Will you cheer for Asante Samuel? 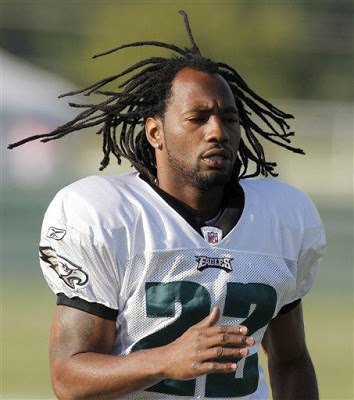 More than anything, Asante Samuel was real intercepting 23 passes in four seasons with the Eagles. When his tackling was criticized Samuel announced that the Eagles didn't bring him in to tackle. And he was right. They wanted interceptions. A few years later the general manager said basically that the Eagles didn't add Dominique Rodgers-Cromartie or Nnamdi Asomugha to tackle. When Samuel's livelihood was threatened following the acquisition of the the preceding cornerbacks he took it like a superstar. Didn't like it but he did his job. Late in his final season with the Eagles, Samuel's jarring tackle in Miami produced a fumble he himself recovered. Go figure. It all comes full circle Sunday when Samuel and the Falcons come to the Linc. Samuel said in this piece the fans "better cheer me. "Or we're going to have a problem right there in Lincoln Financial Field," Samuel said. "All you fans, all I did for y'all, Y'all better cheer for me." Will you cheer for Asante Samuel Sunday? With Patterson back, who goes?